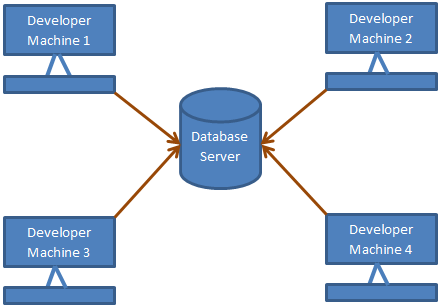 Developer Machines 1,2,3 and 4 connects to the database server using SSMS. Thanks a lot, It was very Quick Detailed & Targeted learning. What Do you mean by developer machine 1,2,3,4 in the ending of your slide. Is it mean by 1 PC with 4 different user or anything else ??? that means One server which is connected to all developer machine. (Where actually Database has been installed. @technoguy: let say 4 of us are programmers/developers in a company. We all need to access the database to each do our individual projects. This requires that we each login to the database using our own laptops/desktops, also using our own login ids and passwords. So, for the most part, this usually means that we get to log in with our own machines...hence 4 different computers. please give me the link... where can i download ssms from????? How does one creates a database with SSMS 2012 and maintains it? Thank you sir your videos are too good. should probably start sql with data modeling. then build on those basics. how to set not null a column at the time of alteration in SQL server ? HOW TO RENAME A Column IN SQL SERVER?